Michigan Birth Injury Lawyers | Study Shows that Many Hospitals Fail to Meet Safety Standards for Performing Vaginal Birth After C-Section Procedures (VBAC). A vaginal birth after C-section (VBAC) is the vaginal delivery of a baby by a woman who previously has undergone a C-section. Due to the high rate of maternal injury and fetal asphyxia (baby severely deprived of oxygen) associated with VBAC, the medical standard for many years was to deliver a baby by C-section if the mother previously had a C-section. In the last few years, however, the American College of Obstetrics and Gynecology (ACOG) has begun to recommend VBAC, but only in low risk cases in which patients are carefully chosen and thoroughly informed of the risks and benefits of the procedure. A VBAC can be very risky for the mother and baby. It creates a high risk of one of the most serious complications of labor and delivery, uterine rupture. When the uterus (womb) ruptures, the baby’s oxygen supply can be severely decreased (hypoxia) or completely cut off, and the baby may be expelled out of the womb and into the mother’s abdomen. In addition, bleeding caused by the rupture can be life threatening for the mother and baby. Indeed, when a rupture occurs, the baby must be delivered immediately by an emergency C-section in order to minimize the injury that can occur as a result of severe hypoxia. Hypoxia and asphyxia can cause hypoxic ischemic encephalopathy (HIE), which often leads to permanent brain damage in a baby, including cerebral palsy, seizure disorders and intellectual and developmental disabilities. As soon as the baby is delivered, the uterus is repaired and in severe cases, the mother may need to undergo a hysterectomy. Given the potential of such serious complications, it is crucial that a hospital or birthing facility be capable of properly handling the emergent situations that can result when a VBAC is performed. This includes having the capacity to perform an emergency C-section, which means that appropriate personnel and equipment are essential. Specifically, there must be qualified nurses, an anesthesiologist, and a physician who can competently monitor the mother and baby and perform an emergency C-section. There also must be personnel and equipment for neonatal resuscitation. In the case of a uterine rupture, the hospital should be able to perform the C-section in 10-15 minutes or less. There must be availability of a licensed practitioner who is credentialed to administer an appropriate anesthetic whenever necessary. A qualified physician with obstetric privileges to perform operative vaginal or C-section delivery should be readily available during administration of anesthesia. A physician with obstetric privileges who has knowledge of the maternal and fetal status and the progress of labor should be readily available to deal with any obstetrical complications. There must be availability of a licensed practitioner who is credentialed to maintain support of vital functions in any obstetric emergency. There must be availability of anesthesia and surgical personnel to permit the start of C-section delivery within 30 minutes of the decision to perform the procedure. There must be immediate availability of obstetric anesthesia, nursing personnel, and a physician capable of monitoring labor and performing a C-section, including an emergency C-section after VBAC. Appointment of a qualified anesthesiologist to be responsible for all anesthetics administered. Understand the mechanism by which a newborn may be depressed, such as acidosis, drug reaction, low blood pressure, trauma, infections, etc. Rapidly and accurately evaluate the newborn’s condition, including the APGAR score. Have knowledge of specific indications for resuscitation of a newborn. Be proficient in newborn airway management, including mechanical ventilation (breathing machine) and intubation (putting a tube in baby’s airway, thereby creating an artificial airway), cardiac massage and maintenance of temperature stability. Twenty-four hour in-house anesthesia, obstetric and neonatal specialists are essential. These maternity units also should have availability of sophisticated monitoring equipment. Furthermore, although the ACOG and ASA are using 30 minutes as a guideline for the maximum time that can occur from the decision to perform a C-section to the start of the surgery, other literature and guidelines recommend much shorter times, depending on the complication the baby is experiencing. If a rupture occurs during a VBAC, the time from decision to perform C-section to actual delivery should be 10 – 15 minutes or less. As length of time of oxygen deprivation increases, the chances for severe brain damage in the baby also increase. When a woman undergoes a VBAC, it is crucial that qualified personnel and appropriate equipment be available since there are such serious risks associated with the procedure. Unfortunately, a recent study found that many hospitals do not meet the standards just discussed. If you experienced complications during a VBAC and your child developed an injury such as HIE, cerebral palsy, or developmental delays, the team at Reiter & Walsh ABC Law Centers can thoroughly examine your medical records and determine if any negligence – including failure to provide adequate medical personnel and equipment during labor and delivery – played a role in your child’s injury. It is imperative that very close monitoring of a mother and baby occur during labor and delivery, given the severe complications that can occur during a VBAC. It is crucial that physicians pay close attention to the fetal heart rate and be prepared for an emergency C-section, which must occur if even one sign of a uterine rupture is present. Failure to properly monitor the mother and baby and to notice signs of a rupture or a nonreassuring fetal heart rate is negligence. Failure to follow standards of care and to quickly and properly deliver the baby also constitutes negligence. If this negligence leads to permanent injury in the baby, it is medical malpractice. The nationally recognized Michigan birth injury lawyers at Reiter & Walsh ABC Law Centers have many years of experience in birth injury cases, including HIE, uterine rupture and VBAC cases. If you experienced any of these complications during pregnancy and your child developed an injury such as HIE, we can help you. Our skilled Michigan birth injury lawyers will work tirelessly to get you the compensation you and your family deserve. Attorney Jesse Reiter, president of ABC Law Centers, has been focusing solely on birth injury cases for over 28 years, and most of his cases involve hypoxic ischemic encephalopathy (HIE) and cerebral palsy. 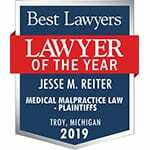 Michigan birth injury lawyers Jesse Reiter and Rebecca Walsh are currently recognized as two of the best medical malpractice lawyers in America by U.S. News and World Report 2015, which also recognized ABC Law Centers as one of the best medical malpractice law firms in the nation. The lawyers at ABC Law Centers have won numerous awards for their advocacy of children and are members of the Birth Trauma Litigation Group (BTLG) and the Michigan Association for Justice (MAJ). In fact, Jesse Reiter is one of only 2 attorneys in Michigan to ever be elected Chair of the BTLG. If your child was diagnosed with a birth injury, such as cerebral palsy, a seizure disorder or hypoxic ischemic encephalopathy (HIE), the award-winning Michigan birth injury lawyers at ABC Law Centers can help. We have helped children throughout the country obtain compensation for lifelong treatment, therapy and a secure future, and we give personal attention to each child and family we represent. Our nationally recognized Michigan birth injury law firm has numerous multi-million dollar verdicts and settlements that attest to our success and no fees are ever paid to our firm ­until we win your case. Email or call Reiter & Walsh ABC Law Centers at 888-419-2229 for a free case evaluation. Our firm’s Michigan birth injury lawyers are available 24 / 7 to speak with you. Watch a video of Michigan birth injury lawyers Jesse Reiter and Rebecca Walsh discussing vaginal births after C-section (VBAC), delivery room errors and indications for C-section deliveries.